Yoga practice and lifestyle are about being in-tune…. In tune with your mind, body, and the surrounding world. Yogis follow a set of guidelines to navigate this life in the form of the eight limbs of yoga, or in the form of a set of guidelines and practices for living a peaceful existence both inside and out. One way to be in tune with yourself and the world is to follow the moon phases. The energy of the moon is strong and ever changing ( as are WE!). 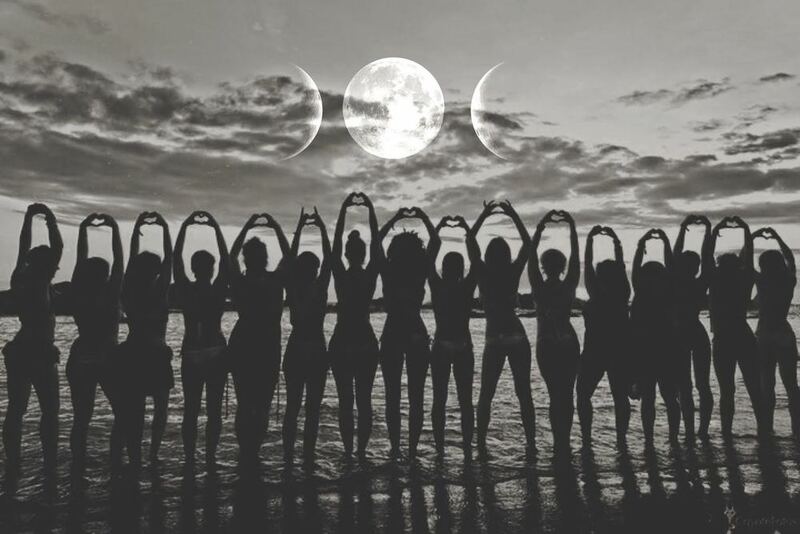 Twice a week we offer Mindful Moon Flow yoga classes and once a month a women’s circle to celebrate the full moon in community. What you’ll find on this page are ways to follow along with our Moon flows through meditations, journal prompts, and information about the moon phases. There is also information about our circles. There are links to go to the pages where you can look at schedules and reserve a place to participate in these beautiful classes and events in person. Here you can follow along on your own to begin your own practice of following the moon cycle and getting in touch with how the moon shows up in your life. Can’t always (or ever) make it to our Mindful Moon Flow classes but still know you need the gentle flow of the moon, the meditation? In our classes we have a meditation and intention setting based on the current moon cycle (special intentions on the new moon for the month), a flow through moon salutations—a slower paced cooling companion the typical sun salutations of most vinyasa classes, and then we finish with guided meditation, and savasana. This is the spot to check in for the details as we follow the moon each month. The New Moon in Aquarius: The New moon in Aquarius falls in a time of year for us above the equator that is cold—or here in Michigan, a polar vortex. It is so easy in the winter in cold regions to become isolated, especially when winter weather warnings and school cancellations prevent you from travel and change your plans last minute. Feeling excluded and isolated are common at this time of year. Aquarius is all about group efforts, communication, inspiration, and making improvements. Even in this wintery freeze, we can channel the energy of the new moon in Aquarius to get through this season together, building as a team. About the Aquarius moon: Aquarius is all about social connection and heightened communication. This sign is high frequency and when the moon is traveling through Aquarius you may feel the buzz and feel frazzled. This internal buzz may make you feel the need to connect with people, reach out to old contacts, or to connect and communicate with the inner self. The moon in Aquarius is a good time to spend working on the self or on relationships. This is an exciting time, but sometimes with lots of emotional excitement and buzz we can be quick to make decisions or cut things out. Try to look for connection, not be too hasty in decision making, and be mindful of making too many commitments or starting too many new projects as you can easily overextend yourself in this time. Aquarius is an air sign, with the heightened buzz about, you may feel or seem eccentric to those around you, and especially if you feel you’ve overextended yourself, be sure to reconnect with the earth to ground yourself in this moon Phase. When intention setting, use words as if you are already living the thing you intend to do. To create that manifestation of your intention you must feel the intention with your entire being—use words such as “I am” “I will” and so on. If you’re new to setting intentions here are some you can start with and maybe you find you want to personalize them. I honor my unique contributions to this world. I work to create a better and more inclusive community. Guided Meditation: For class we used a variation of the meditation found here from Melanie Beckler. Do you have a lot of loose ends in your life currently? If yes, how might you be able to work on focusing your attention and energy toward becoming grounded and finishing those tasks that are open? Are you happy with the community that surrounds you? Depending how you answer, what are things you could do to cultivate deeper meaning and connection within your community? or What are you cultivating in your community that makes you feel positive about your surrounding innovators and supporters? Waxing Crescent in Pisces: The waxing crescent moon means that the illumination of the moon is in a crescent shape and less than have the moon is illuminated. Just like with the new moon, this is a strong time of intention setting. Keywords for the Crescent phase are: expansion, growth, struggle, and opportunity. It is the time in a lunar cycle that you gather the wisdom learned in the New phase and communicate your intention to move forward- state your goals for this cycle. About the Pisces moon:The Moon in Pisces reveals our permeability. We dream and need to ground our dreams. We care, but can become overwhelmed by our awareness unless we feel spirit working through us. This transit is a time to imagine, share, sense, meditate, nurture, soak, and find constructive ways to be sensitive. During Moon in Pisces emotional life is more introverted, intuition is at its height and psychic energy is powerful. You are able to get in touch with your deepest self, but it can also be a time of vagueness, unclarity, and uncertainty. Pisces is about endings as a result of internal processing. You may notice a lot of people around you being moody. A lot of women have a good cry during this transit and they may need your shoulder to lean on and share their troubles with. We cry during Moon in Pisces because it's the most watery of all signs. Pisces Moon brings a retreat into the self to do the internal processing and contemplation necessary at least once during a lunar cycle. The outer world busyness becomes clouded and cold hard facts slide through your fingers like slippery fish. Things are not what they seem, so don't be confused by this transit. With Moon in Pisces we feel the world with compassion, heightened senses and strong imagination. We need quiet time in the temple or back under our covers to deal with sensory overload. This transit can be a time to vision, listen to our inner voices, allow creative juices to flow and to touch each other with new awareness. Moon in Pisces is the best time to work magick involving dreamwork, clairvoyance, telepathy, music and the creative arts. Healing rituals for ailments of the feet or lymph glands are also done at this time. Those born under a Pisces moon came here to feel everything; they may need to filter impressions and find their deep strengths. These people offer us insight, imagination and subtle, compassionate medicine while encouraging our vision. From Sobeit. Intention setting for the Pisces moon: In this time of heightened emotion, focus on your overall intention for the month. To set a daily intention to help manage the emotions and avoid feeling overly emotional, sensitive, or overly focused on the negative, set intentions to create positivity and grounding. What is a Full Moon Women’s Circle? The full moon retreat happens on the Saturday closest to the full moon each month. During this time, the full moon brings heightened energy and by gathering together we tap into that energy to renew ourselves. We invite you to gather at Lotus Jo’s Yoga Studio and stay the night. Yes! Like a good old-fashioned slumber party except as grown-ups, the focus is on getting rest and leaving refreshed. Each month the moon has a name and that is the theme for the month. Depending on the month, we will alter our activities but they will always be focused on letting go, cleansing energy, and renewing energy. A detailed description will be offered each month as to the theme and meaning, as well as an itinerary. The basic structure will always be the same. Arrival time of 7:30pm, settling in. Circle to introduce and to talk about the theme and answer questions. Then there will be a guided meditation, flow, activity, followed by alone time. During the time alone, you are invited to write something down to let go of and we will put that paper in the fire, and also to set an intention for when you light a candle-hope for what is to come. We then cleanse the space and close for the night. Always light snacks, tea, etc. provided.